However, where does the prestigious Daytona 500, contested here each February, rank against Saturday night’s Coke Zero 400 at the facility known as the World Center of Racing as well as other events on the NASCAR circuit? “Yeah, well it’s so hard to rank them,” said six-time Sprint Cup champion, Jimmie Johnson, when asked about the pecking order of races. “Tracks have different meanings for different drivers and team members. All of us have tracks that are fond to us for whatever reason. 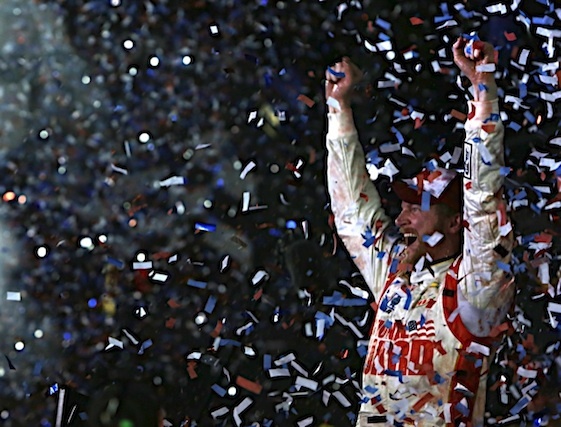 “Winning in Daytona is always a special thing. If it’s an IROC race or, I’ve tried many times here in a Grand-Am car here to win; whether it’s the six-hour even in the summer or the Rolex 24. I wouldn’t mind winning a big wheel race in the infield. It wouldn’t bother me a bit to win in Daytona (laughs). For me, it’s up there on the list for sure. Fresh off his popular win in this year’s Daytona 500, Dale Earnhardt Jr. can join two of the sport’s elite drivers if he drives his No. 88 Hendrick Motorsports Chevrolet to victory lane here Saturday night. especially the way the package is now. It’s real hard to get by the leader and we know that pretty well now from the way we ran in Daytona earlier this year. 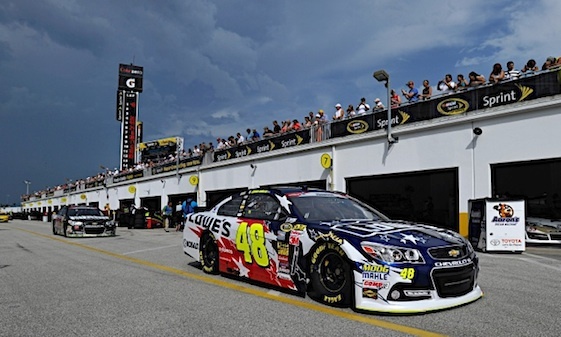 “I really haven’t gotten a chance to see how this car is going to respond to the track. I am certain it’s going to be competitive, but knowing it’s not the same car though; we are going to have to see if it has any different characteristics in the balance. It’s a lot different surface temperature than we had in February so we have to figure out how that is going to affect the way a car drives and if the balance of the car is going to be different. I would welcome the car to be more challenging as far as the balance at this place and to where we use a little bit more of the race track. Getting handling to come into play would be a bit more fun. 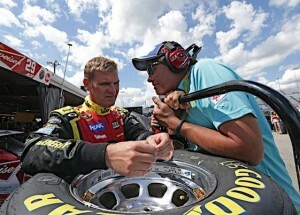 Brian Vickers and his Michael Waltrip Racing teammate, Clint Bowyer, will have a special drafting partner at their disposal during Saturday evening’s 160 lap event in Daytona. Two-time Daytona 500 champion Michael Waltrip will make a rare start in the No. 66 Toyota fielded by Jay Robinson Racing. When Elliott Sadler drove his No. 11 Joe Gibbs Racing Toyota to victory in this spring’s Nationwide Series race at Talladega Superspeedway, much of the credit was due to the work of his spotter, Brett Griffin. Sadler said Thursday in Daytona that he learned a value lesson several years ago when he put away his helmet for a day and climbed atop the spotters’ stand. “The biggest lesson I learned at spotting for restrictor-plate races is I spotted for my brother (Hermie Sadler) one time at Talladega in a Nationwide race about seven or eight years ago and those guys can’t see anything like they said they could,” Sadler said. “So, that’s probably the best thing I’ve ever done.